Hotels are not just another place to lay your head anymore while you park hop from sun up to sun down. They have become just as much a part of the actual vacation that families often plan to spend a day or two enjoying the hotel or resort itself! No parks or theme parks; just a super fun, swell time spent relaxing at the pool and enjoying the resorts amazing amenities. With so many hotels adding a plethora of features like water parks or bowling allies, and additionally using themes in their resort-style, hotels and resorts are experiences themselves that make for memories too. 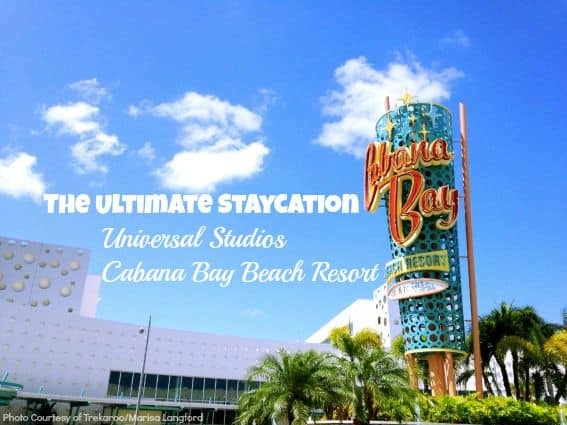 Universal’s Cabana Bay Beach Resort is the perfect place for an ultimate staycation in Orlando, Florida. 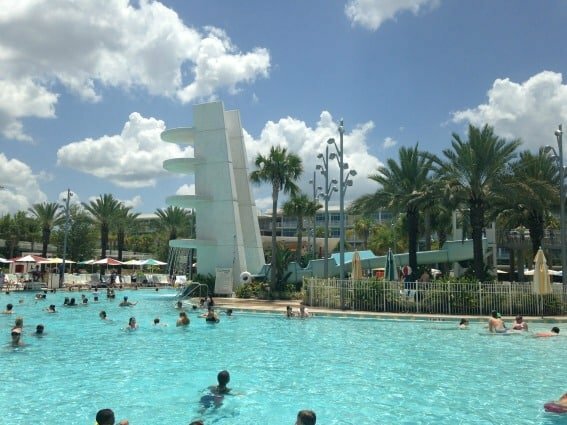 Of course there are some amazing theme parks to explore (and perks for staying at a Universal Orlando Resort), but here is 5 reasons that Cabana Bay Beach Resort is the perfect place to staycation, reminiscent of family vacations from the good ol’ days when life was simpler and a vacation meant you relaxed. In so many ways, the two pools at Cabana Bay steal the show. Each designed with a different vibe, the pools individual style will have you pool-hopping all day long. 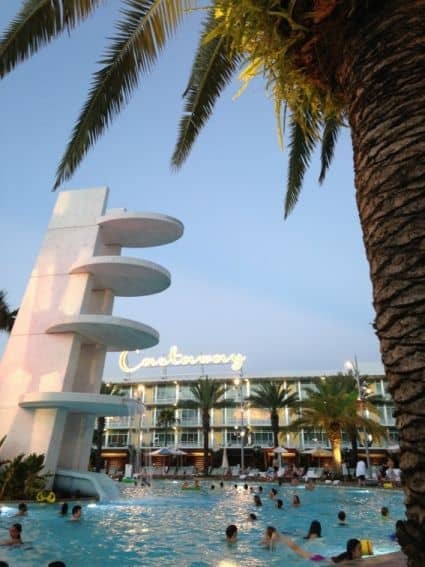 Start the day floating at the Lazy River Courtyard and later cross over to visit the Cabana Courtyard Pool, which is the most happenin’ place on a hot Florida summer day. The (non-active) retro dive tower houses a slide fit for the whole family. The zero-entry pool access, a nearby sandy beach activity area with ping-pong, a giant Connect Four, and bean-bag toss, along with a splash-ground with plenty of water fun for little ones, will have you staying the entire day at the pool. Dine pool-side at the Hideaway Bar & Grill or Atomic Tonic and order frozen drinks to cool everyone down. The pool and pool-side options are plenty so you won’t be hearing, “I’m bored!” anytime soon! Tip: Stop and buy an inner tube or raft to bring when you visit. They are available for purchase at The Tube Shack for $8 or guests bring your own. It was ironic that my ten-year-old son told me that this was the hotel of the future. The 1960’s vibe carries throughout the entire hotel and totally has guests jammin’ with the Beach Boys as soon as they walk in! Even the Swizzle Lounge will have you watching I Love Lucy reruns while grabbing a cold one. The colors, patterns, retro furniture, neon lights, and even the words you’ll remember from the past, make your vacation come alive and help pass on the memories to little ones. 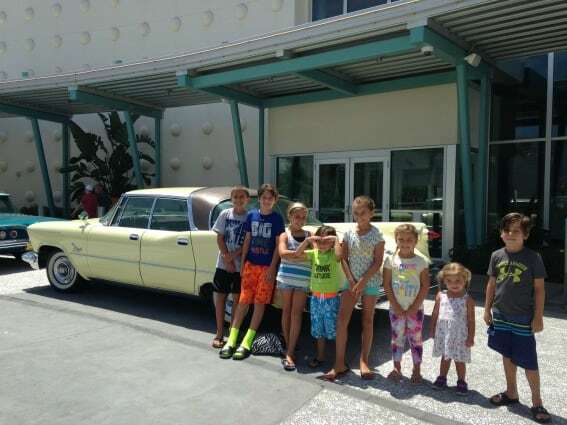 Stop to take a picture with the cool cars of the 60’s and bring the Hawaiian shirt and plaid pants. Dressing the part might just be half the fun! When spending time with the family is what you really want to do on vacation, this is the place to go. Going bowling with the kids at the Galaxy Bowl is a great way to unplug with everyone and the retro decor is sure to make you smile. Of course, what kid doesn’t like a few arcade games, so pop on over to the Game-o-Rama and treat them to a few games! And of course, hit up Bayliner Diner for the Frozen Yogurt Bar too! A sweet treat is always a fun way to end the night. Pop outside to sit by the fire pit it or the pool-side sunset movies. Classic vacation fun under one roof while still never leaving the building. Tip: Bowling is a special discounted price during the day and be sure to make reservations if you want to bowl at night. When traveling with kids, it’s hard to enjoy a little alone time to unwind once they hit the sack at a decent time, to be ready for the next big day of fun. The spacious suites have room for six, a mini-kitchen, (including microwave, fridge, sink, bar sitting area, and coffee maker), as well as a sitting room that can be closed off by an adjoining door. 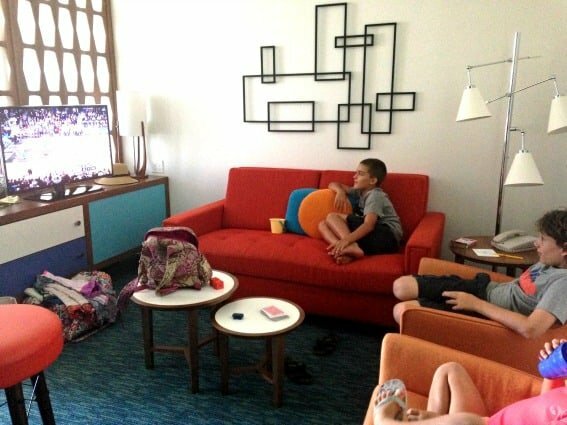 This made our stay so much more enjoyable because we got to relax after the kids went to sleep and could watch TV on the 40″ flatscreen in the living room while closing off the bedrooms. These suites are large and affordable for families wanting to stay at an on-site hotel at Universal Orlando. Tip: There is a closet nook in the family suite that fits a pack ‘n play too. Let’s face it, aren’t we all looking for a several ways to save a few bucks while on vacation? At Cabana Bay Beach Resort, you’ll have the ability to stock your fridge with snacks, drinks, and more. Be prepared with some easy to make items that are good on the go and healthy too! We loved the Bayliner Diner where many items were a la carte and weren’t over priced. The free Bayliner shuttle picks up outside the main lobby and drops guests off at Universal CityWalk. Saving on parking always helps! 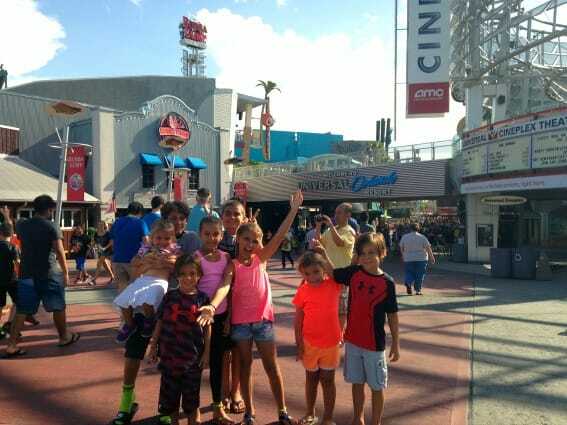 Saving Tip: Universal CityWalk has dining and entertainment for the whole family. It’s a great place to visit for an afternoon or evening to dine or see a show. We loved that Cowfish has a menu that everyone could agree on with sushi for adults and edamame, sweet potato fries, and burgers for the kids. This is a great place to explore and feel like you’re at a theme park without actually going into a theme park. And our favorite family show to see (in all of Orlando) is Blue Man Group, right at Universal CityWalk! If Universal Orlando is on your itinerary, Universal’s Cabana Bay Beach Resort guests enjoy early park admission to The Wizarding World of Harry Potter, one hour before the theme park opens (of course, valid theme park admission required). Staycations have become more popular as resorts offer additional amenities. Often times it’s the change of scenery and the family and friends you spend time with that make the vacation memorable, so a trip not too far from home can always be a good idea. Check out the best resorts in Orlando for a staycation! Check out the top ten things we recommend to do in Orlando too! Disclosure: We were offered a complimentary stay at Universal Cabana Bay Beach Resort to find out first hand what the resort had to offer. All opinions are my own. All photos courtesy of Marisa Langford.